After supposedly “earning” a title match against the Boss, Alexa Bliss looked to win the championship from Sasha Banks. The Fairy Princess of NXT did her best to end the match quickly with multiple pin attempts but Sasha Banks weathered the sparkly onslaught and showed Bliss what it meant to take on the champion as she took control of the match with a well timed kick to the face. The NXT Women’s Champion trash talked and landed her patented double knee to the midsection of Alexa further taking the glitz out of Miss Glamour. But little miss Sparkle shine found her second wind and began to bring the fight right back to the champion and sent Banks crashing to the outside of the ring. Sasha looked to be in trouble as Alexa was able to hit her Glitz Flip for a two count. But the challenger’s frustration and hesitation on the top rope cost her the match as the Baddest Diva in NXT knocked her from the ropes and locked in the Bank Statement to retain her championship. Definitely love seeing NXT women wrestle. Still don’t see how or why a count out victory would have earned Alexa Bliss a title shot, but at least the match was fun. Both women got off huge offense but in the end it was Banks who prooved why you just don’t mess with the Boss. She fought hard for that title and she is NOT going to let it go. Gone are the days of Charlotte’s reign. Sasha Banks is a fighting champion who has what it takes to make her title reign memorable and exciting. The Champion wasted no time in taking control of the match in a way that has become typical, mind games aplenty. He refused to let Finn dictate the pace and rolled out of the ring. Once back in though, he delivered a devastating boot to the challengers stomach and locked in a painful head lock to further take the energy from Finn Balor’s potential (and yet to be seen) offense. At each oppertunity, Kevin mocked Finn, asking him where the demon was, but this gave Balor time to regain a bit of his strength and create his first real chance at taking control as he landed a drop kick on the champion. But as would be seen through out the match, EVERY TIME Finn Balor seemed to be mounting a decent and potentially winning offense, Kevin Owens would counter or reverse and put a halt to anything the Irishman had up his sleeve. Not amount of double foot stomp attacks or high risk maneuvers were enough to keep the champion down for long. But I will give credit where it is due, I have yet to see anyone bring the fight to Owens like Balor did. In the end, however, it just wasn’t enough as Kevin Owens caught Finn and landed a pop up powerbomb. Owens got the 1, 2, 3 and Finn Balor lost his chance at the NXT title. This match was amazing. It wasn’t as vicious a beat down as Sami Zayn got but it still had its cringe worthy moments. 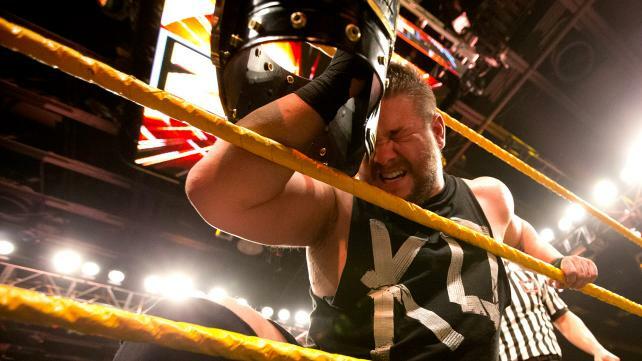 Kevin Owens is a beautifully sadistic champion that enjoys beating down his opponents. He will find a weakness and exploit it, Such as he did when Finn Balor injured his leg when he dove onto Owens. Kevin worked that injured leg with submissions and blows that easily took the wind out of the Irishman’s sails. But as stated above, Finn did bring the fight to Kevin and made him work for the victory. But here’s the thing, I doubt there is a force in all of NXT that could take the title from Kevin. This is a man fighting to make a better life for his family by any means necessary. But by all means, send all contenders to try. I do enjoy watching Kevin Owens destroy things. This entry was posted on Friday, March 27th, 2015 at 1:49 pm	and is filed under Events, News, Television. You can follow any responses to this entry through the RSS 2.0 feed. You can skip to the end and leave a response. Pinging is currently not allowed. « Podcast #57 with Special Guest James Faust: Dallas International Film Festival, ‘The Blues Brothers’, Lex Luthor!